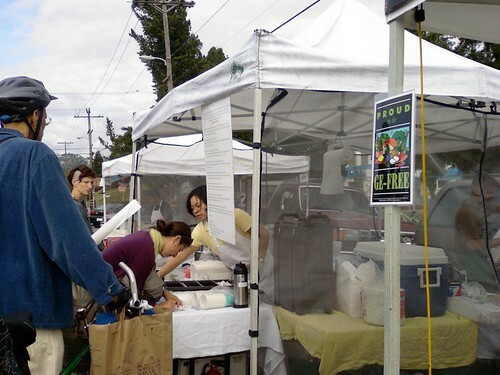 Andy and Cindy’s Thai Cuisine stand, which had a line, although it’s hard to tell from the photo. They use organic free range everything I think, which I suppose is like most of the stands at the Farmer’s Market. Theirs is the only one with a consistent line though. Still we’ll have to go back and try some of the other stuff. This is Chicken Satay and Curry Combo with an extra chicken satay a la carte. 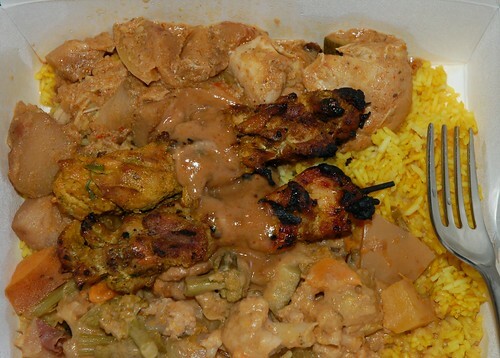 It’s one chicken satay with chicken curry and vegetable curry, so we got an extra one for easy splitting. V. yums! The satay is really tender with good barbecue flavor. The peanut sauce is delicious. I really liked the curries, too. Really creamy and good. Both were delicious. 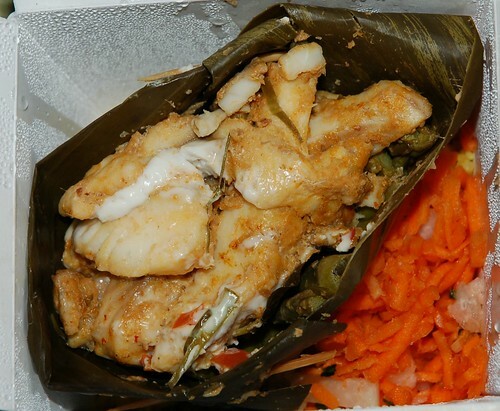 This is Red Snapper (wild caught), steamed with asparagus in a banana leaf. Quite delicious! We should’ve just got it a la carte though because they just put the steamed snapper on top of some rice and shredded carrots, something like that, and we already had rice from the curry. 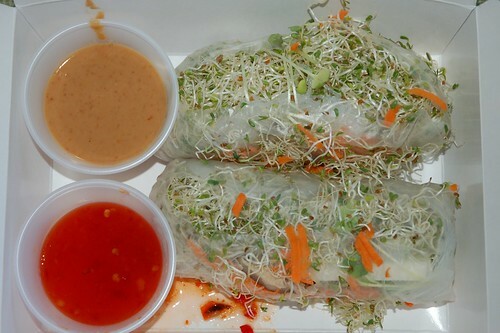 The spring rolls which the chowhound post was so enthusiastic about. Well, I’m not a fan of alfalfa sprouts, so this was not so great for me. Still though, maybe it’s cos the alfalfa was fresh, or maybe the peanut sauce and sweet chili sauce were that damn good, or maybe both, but we managed to finish ’em without picking off too much alfalfa. Honestly the stuff normally tastes strongly of dirt. Yeah, the rest of it was good, and the sauces (usually the most important thing anyways) was good, but it’s too much alfalfa for me. Still I wouldn’t refuse to eat it again. So yup, overall it was really good! For once our complete inability to make decisions or plans for dinner worked in our favor! We’ll have to go back to the Tuesday Farmer’s Market more often. Besides having Thai again, there’s lots of other stuff to try. I wish our markets had this kind of cuisine… heck I wish our restaurants had this kind of cuisine! I can’t find any drool emoticons! Ugh, I’m sitting here at work salivating. Maybe I shoulda looked at this before lunch or closer to dinner cuz now i’m stuck drooling and I really wanna try they’re Thai food now!! Free range too huh? Kudos! If you are going to head over some Tuesday let us know.